Your wedding day is one of the most important and memorable days of your life and should be remembered by everyone for all the right reasons. When you select us to manage your wedding transportation, you can be sure that with our experience, we ensure that your every requirement and need is taken care of. Not only will our fleet of meticulously maintained wedding cars arrive with ribbons and trimmings but our immaculately dressed uniformed chauffeurs will guarantee your transportation is impeccable so that you won’t be late for that perfect day. Our long wheel base vehicles allow you to arrive relaxed & in comfort, the additional 8 inches of leg room in the rear is sufficient to accommodate bridal dresses & long trains. The beautiful leather interior allows the bride to elegantly enter & leave the vehicle with ease. 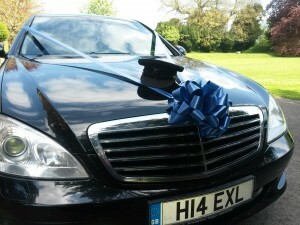 Our wedding cars hire packages are tailor made to suite your individual requirements. As one of the leading wedding transport services in Newbury, Thatcham & Hungerford, we will exceed your expectations by delivering a courteous and professional chauffeur hire service. If this journey is greater than 5 miles, we would recommend an additional vehicle which can be provided. If your wedding has a specific colour scheme, then our obsidian black vehicles will be dressed in ribbons to compliment this. If any of your guests are arriving from abroad or you’re heading on your honeymoon then we will gladly complete the airport transfers. Excel Executive Chauffeurs Ltd © Copyright 2019, All Rights Reserved.